"Plan, Work, Perform, Succeed 26.2"
It stands for Plan, Work, Perform, Succeed in training for a full marathon. 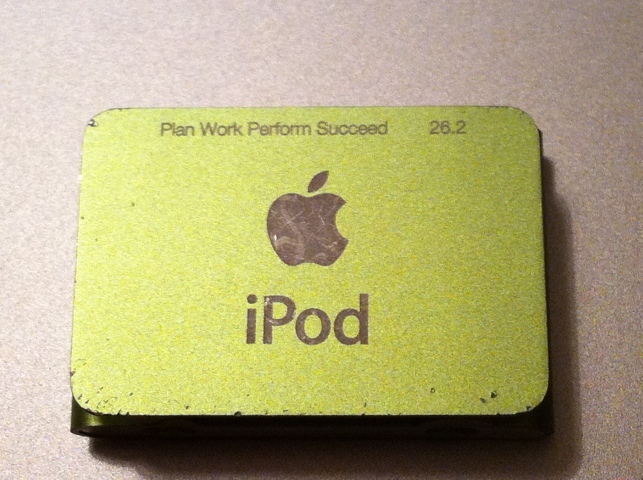 I absolutely love this iPod as a gift because it holds so much meaning. Training for a marathon is more work than most people know. But it’s also more doable than most people realize. One of the benefits of training for that inaugural marathon was a huge sense of pride as Katie was watching me throughout my training and as I prepared for the competition. The gift brought it all together. Rewards are an excellent motivation for training. I can justify a new $49 iPod Shuffle because I’m using it 3-4 days per week and it helps me get through so many long runs. Same with apparel and even food – it’s a worthy expense. But these are still simply tools towards the bigger objective: train and succeed. And then repeat. Sports play a beautiful analogy to life. The lessons of sport have been with me for my entire life. And as I’ve prepared for half and full marathons, I’ve grown into this PWPS mentality. I’ll Plan out my training miles and put it on a calendar. I’ll Work hard at the training and put in the time. I’ll Perform to the best of my abilities based on the training I completed. I’ll Succeed because I planned it out and worked hard. How might you use PWPS in your life? Is there a project at work that needs a little attention to take to fruition? Are there chores at home that could get lined up and knocked out with this plan? Even relationship – does someone in your life need a little more intentional attention? Life is a series of projects. And a successful life is full of doing good things for yourself and others. Go Plan, Work, Perform, and Succeed. Then buy yourself an iPod Shuffle as a reward and do it again. This entry was posted in exercise, Training on May 21, 2011 by Hans Schiefelbein. Thanks for sharing, Hans. Training for my first 26.2 now. PWPS really struck a chord. Thanks Abby. Which one are you doing? Have you done a half yet?